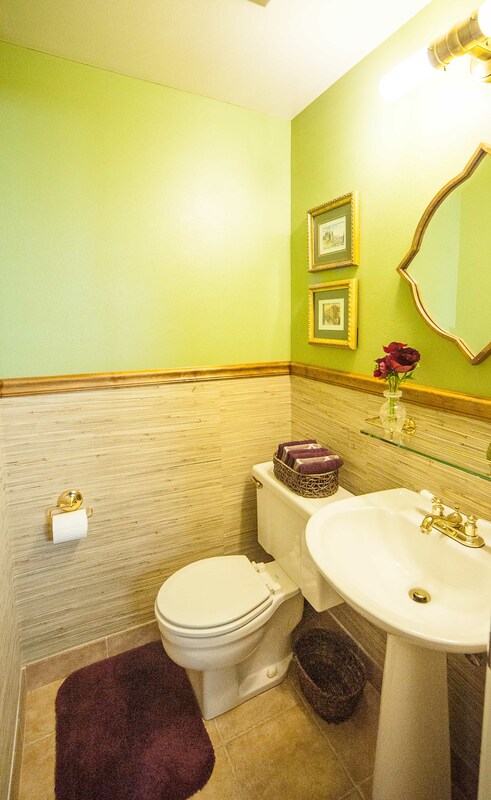 This bathroom had not been renovated for more than 25 years. Bright and cheerful, the room suffered very little wear and tear over the last quarter-decade and had never demanded repair. Nonetheless, the homeowners were ready for change. 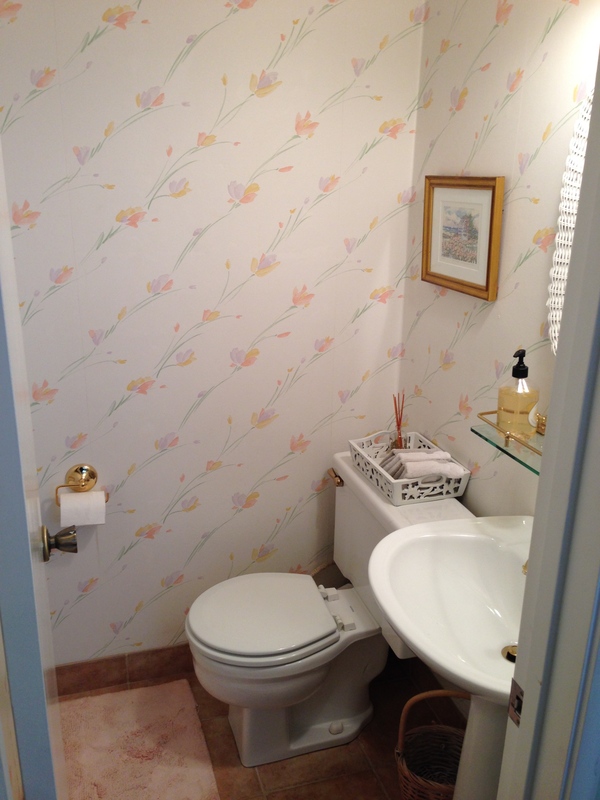 Down came the pastel floral wallpaper, and up went grasscloth, saturated paint, and warm metallics. 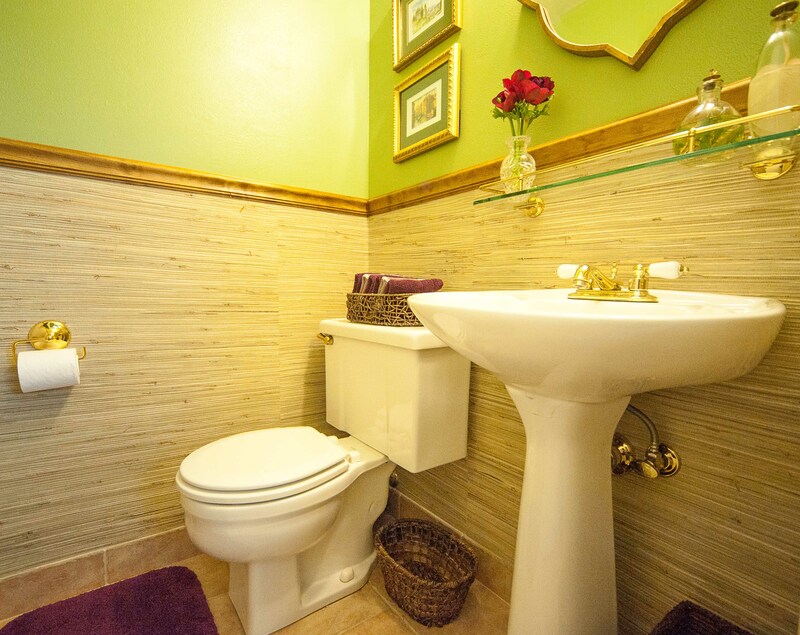 The flooring, toilet, pedestal sink, toilet paper holder, and shelf stayed. 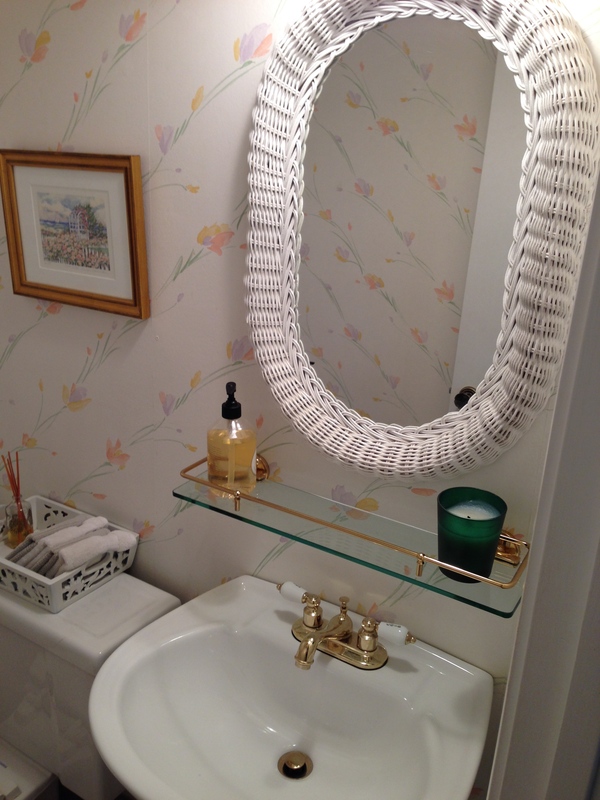 We replaced the wall covering, mirror, lighting, artwork and accessories. 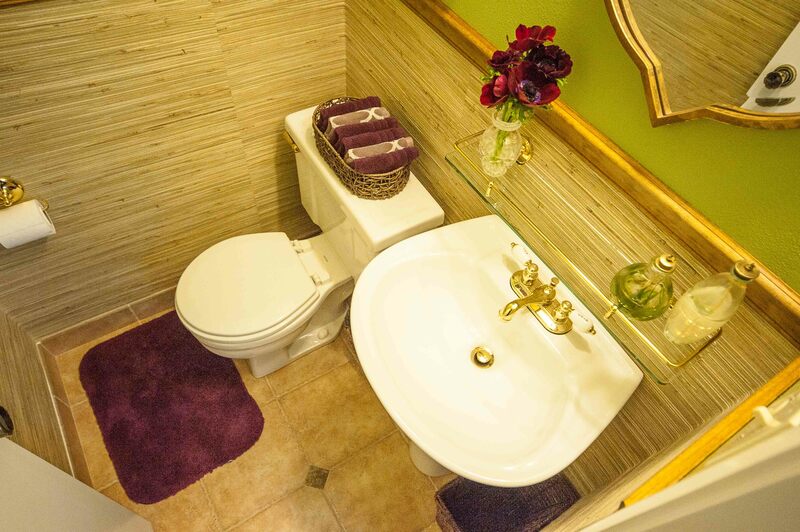 Our goal was to give the space a hint of drama to keep things interesting, while still maintaining a cohesive color flow with the adjoining laundry room and family room. 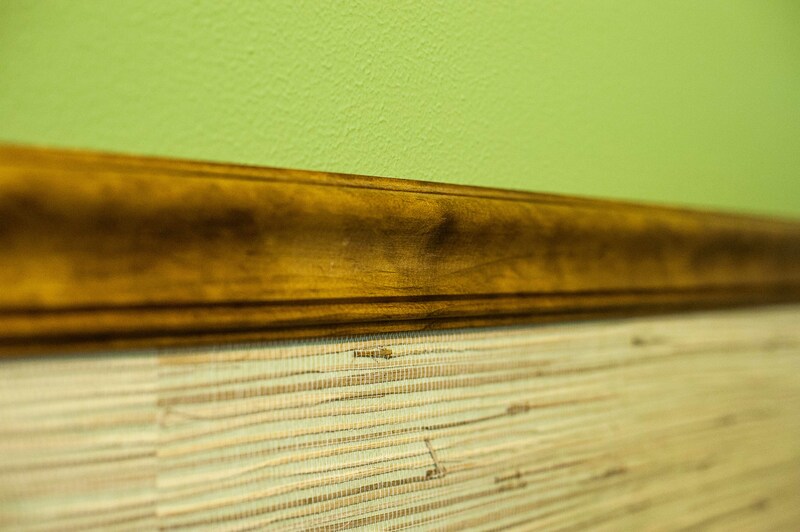 With so little wall to cover, we were able to splurge on gorgeous grasscloth without blowing the budget. We saw no need to replace the old hardware. Haven’t you heard? Brass is back! 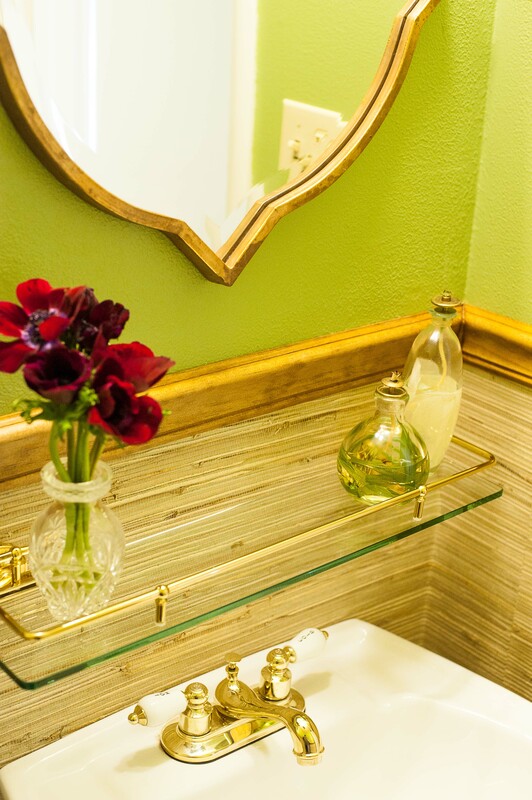 We enhanced the existing brass elements by adding a mirror and light fixture with complimentary warm patinas. 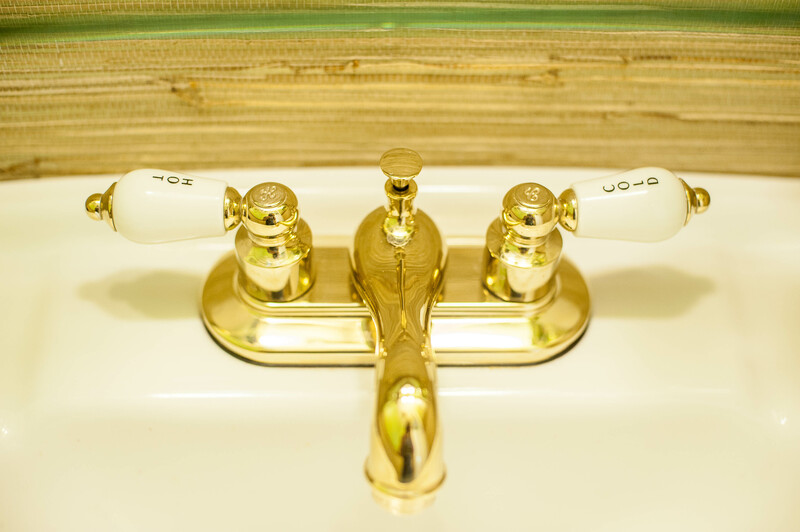 We didn’t worry about matching the exact finish of the metals, but we kept them within the same color family. The biggest challenge we encountered during the installation involved the light fixture. 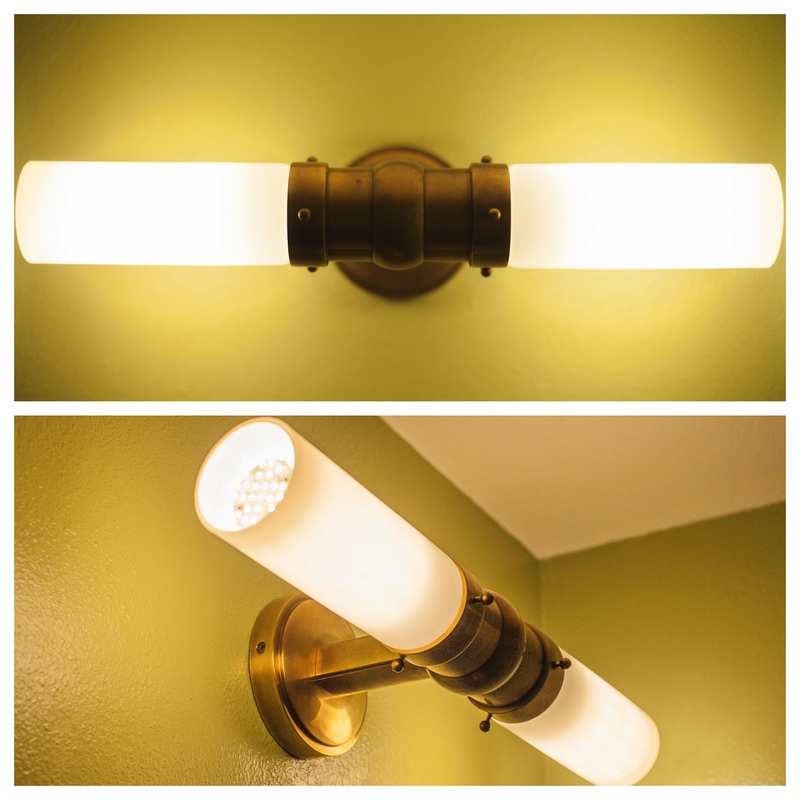 We originally had a funky double sconce with milk glass shades and Edison bulbs. The oiled bronze metal finish was lovely and the proportion of the fixture was perfect. Unfortunately, the milk glass shade was too opaque, creating a sharp line of shadow around the entire perimeter of the room. The lower 6 feet of wall glowed beautifully, but the top 2 feet and ceiling were completely dark. Other glass shades had a similar effect, either due to the shade itself or the metal hardware. We needed diffuse light on all sides of the fixture. Enter the Graydon Double Bath Light from Thomas O’Brien. Not only did it minimize the shadows, but it is a more timeless and versatile fixture than the trendy Edison bulb sconce. Stylistically our problem was solved, but one more dilemma remained. The glass of the new fixture was still more opaque than expected, and it didn’t emit enough light to offset the dark paint and grasscloth. We swapped out the original bulbs for warm LED’s, which produced a more powerful glow without exceeding the fixtures wattage limits. So what do you think? Did we achieve major impact by changing just a handful of elements? 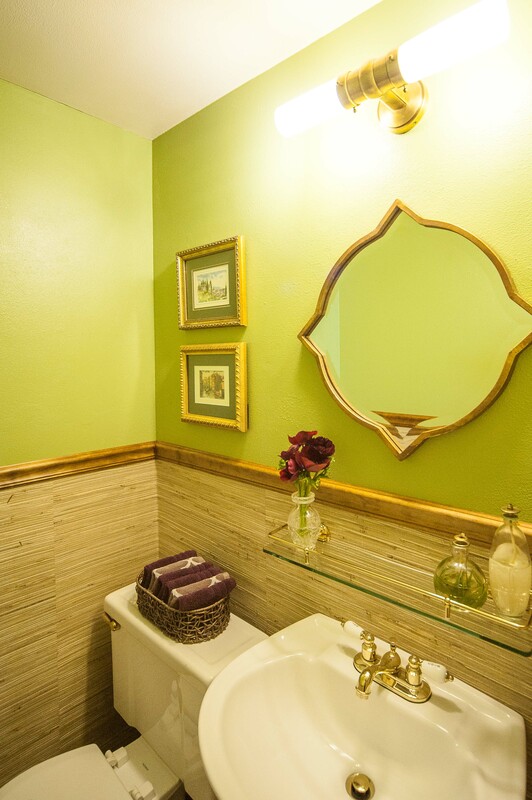 The grasscloth wallpaper was purchased through The Treasure Trove in Lafayette, California. The paint color is by Benjamin Moore. 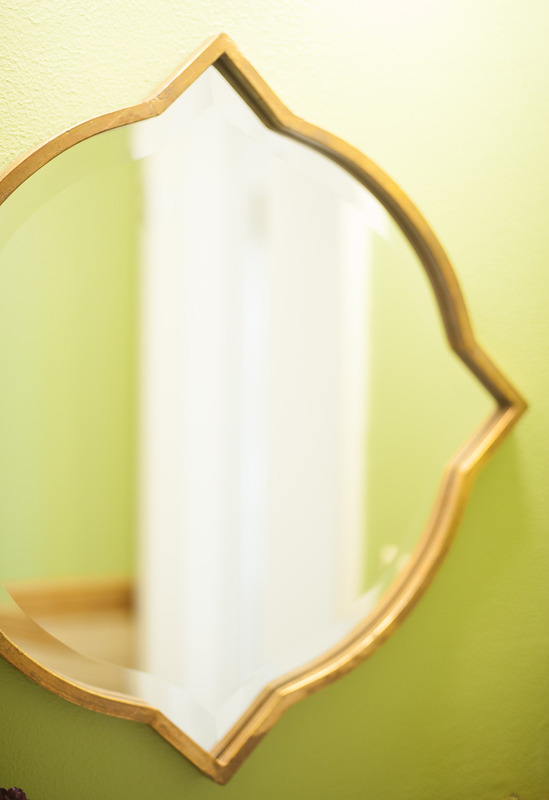 The mirror is the Compass Mirror from Wisteria. 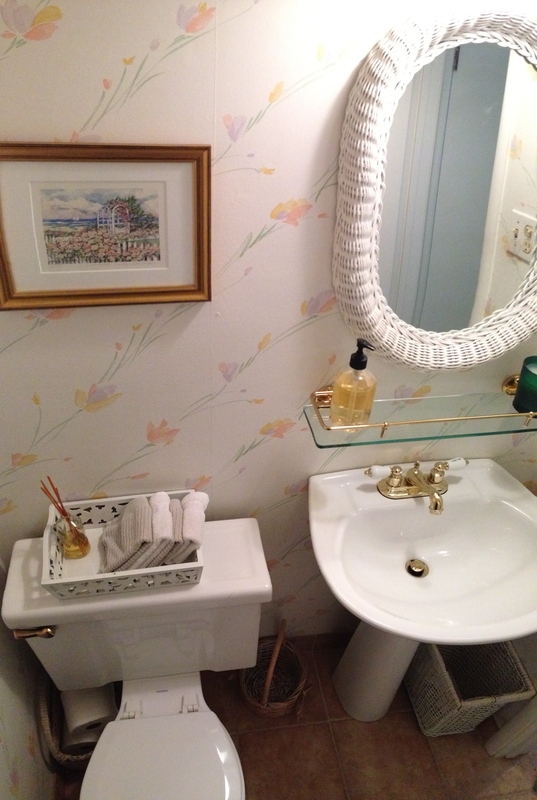 The light fixture is the Graydon Double Bath Light in Hand Rubbed Antique Brass, purchased through Neena’s Lighting. 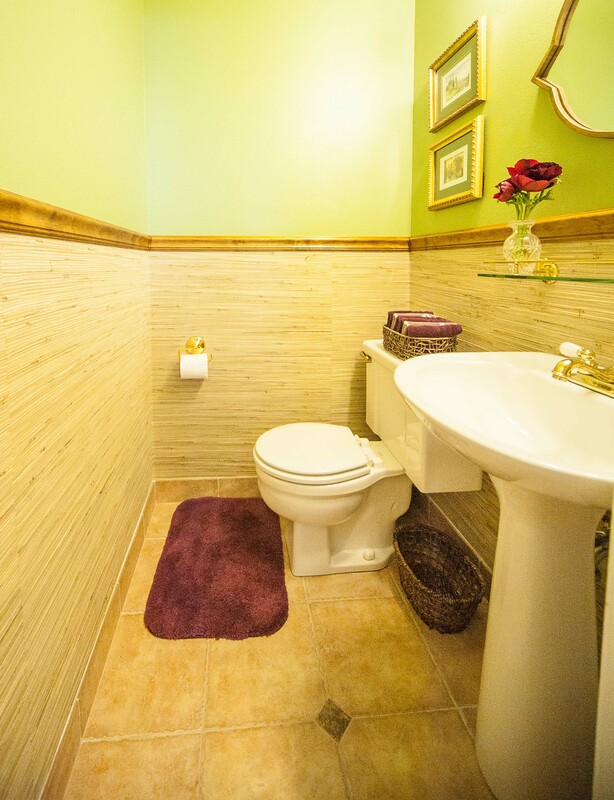 The hand towels, floor mat, and baskets came from Homegoods. The artwork is from my client’s personal collection. Architecture for Humanity is celebrating 15 years of worldwide community service. From rebuilding Mississippi after the destruction of Hurricane Katrina, to designing and building innovative schools in underprivileged communities across Central and South America, Architecture for Humanity has a long history of bringing sustainable design, architecture, and construction services to vulnerable people at a local, community level. Eyewear brand Warby Parker not only strives to bring beautifully crafted, high quality eyeglasses and sunglasses to the public at an affordable price, but for every pair of glasses they sell, they distribute a pair to someone in need. So how do these two charitable organizations come together? 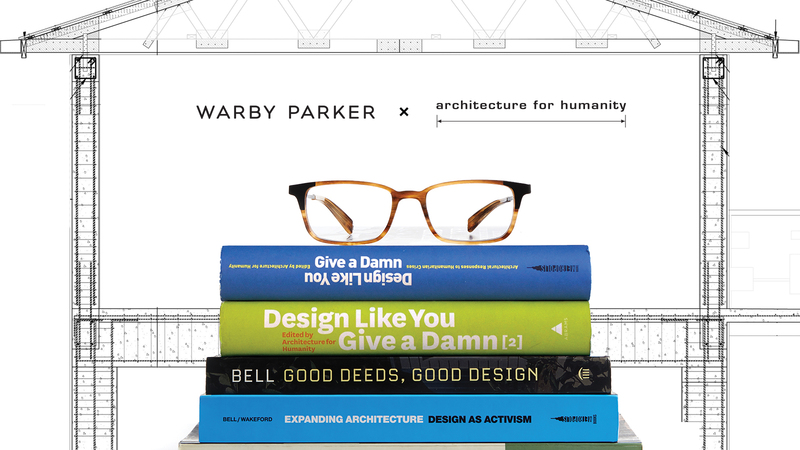 Warby Parker has designed a fabulous new eyewear collection inspired by architecture. 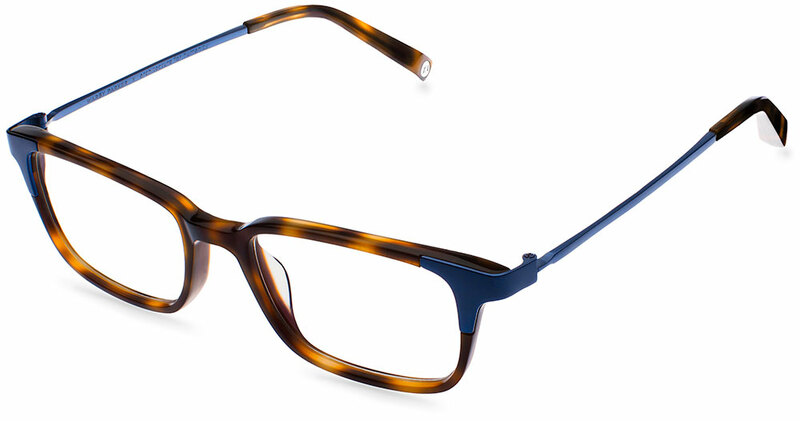 The two frames, Aslin and Fowler, feature streamlined angles and durable materials. In addition to giving away one pair for every pair sold, they will also contribute a portion of each purchase to Architecture for Humanity. I have been wearing glasses for 25 years. At age 11 I looked like a Sally Jesse Raphael groupie in my round red plastic frames. And my current pair is… another red plastic frame. I like to think that the rectangular glasses I’m sporting are a bit more stylish than my 1989 originals, but perhaps it’s time for me to try something new. I love, love, love Warby Parker’s Aslin frame in the “Oak Barrel” finish! The tortoise rim is timeless and versatile, but the deep blue contrast detailing adds just enough edge to keep things interesting. Obviously someone who wears red glasses couldn’t go completely neutral! Added bonus: If you have asymmetrical ears (which I do), then you know that plastic rims with metal arms (is that what the side of glasses are called?) are much more flexible than all-plastic frames, resulting in a more level fit for your face. If the pop of color isn’t for you, or if you are on the prowl for super-stylish new sunglasses in time for spring, the other two options in the Architecture for Humanity collection are equally nice. The Aslin frame in English Oak (above) is the neutral version of my personal pick. The Fowler sunglasses in Jet Silver (below) give the on-trend aviator style a new twist with tortoise and chrome. After purchasing a new pair of Aslin frames in Oak Barrel, I will sleep easy at night knowing that A) I look really awesome and stylish, and B) I helped make the world a better place. With that in mind, it’s hard to think of a reason NOT to buy a new pair of glasses! Visit the Warby Parker website to get a pair for yourself. Their website is full of interesting information, so be sure to read about how their eyeglasses and sunglasses are designed and crafted, as well as how this innovative eyewear company came to be. I love The Land of Nod. Color, whimsy, modernity, playfulness, organization… they get an A+ in every category. But if you are thinking “cute, yes, but I’m not a 7 year old girl,” think again. Children’s brands can be a fantastic source of grown-up style at a reduced price-point. 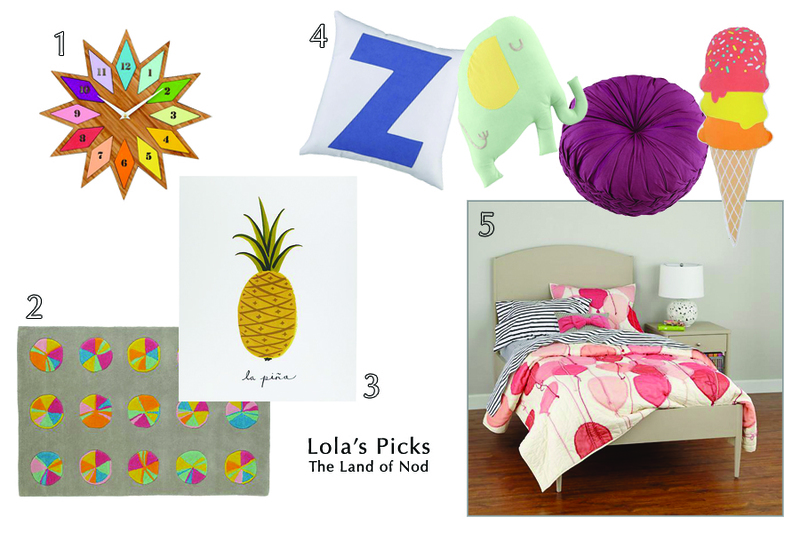 In fact, I recently featured a Land of Nod rug in my Splurge vs. Steal: Multicolor Swirl Rug post. So, it was with great anticipation that I awaited the launch of Nod’s new collection by blogger and designer Joy Cho. As I scrolled through their website, I just couldn’t resist pulling out some of my favorite pieces to share with you. 1. The Chromatic Bamboo Wall Clock is just plain fun. I see no reason why kids should be the only ones who get to decorate with this much color. 2. The Circulation Chest actually has drawers in a variety of sizes, from single cubby, to flat row, to deep square – perfect for organizing all the different piles of stuff that accumulate in our homes. 3. Full disclosure: I actually have the Hangin’ Around Lamp hanging over my own dining room table. You would never know that it is a kid’s lamp. The style is clean and simple with nice proportions and quality detailing (like the clear cord) to rival any of the more expensive versions out there. 4. The Precious Metal Nightstand: they call it a nightstand, I call it a side table. The glossy enamel top over a trim metal base is a classic style, similar to the tables featured in my Splurge vs Steal: Red Enamel Side Table post. The Land of Nod currently offers the “nightstand” in white, navy, mint, and pink. Is the navy my favorite, or am I feeling the mint trend? They are all so cute, I just can’t decide! 5. Featuring a walnut exterior with a glossy white enamel interior, the Prairie School Desk is a versatile, functional piece that exemplifies clean mid-century modern style. 6. 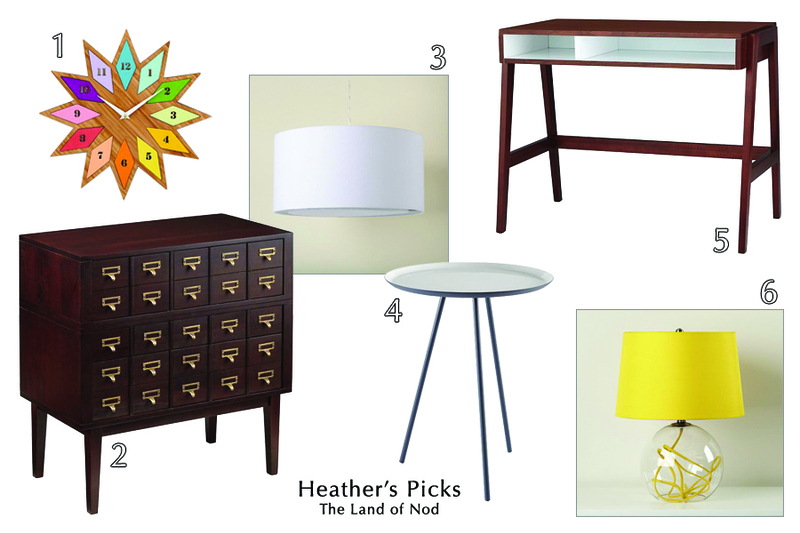 I have a bit of an obsession with bright yellow, and I’ve been coveting the Crystal Ball Table Lamp for some time now. Wouldn’t it look fantastic sitting on top of the Prairie School Desk? 1. Yep, that’s the same Chromatic Bamboo Wall Clock that I chose for my own board. Considering she is just shy of 3 years old and can’t tell time yet, I had no idea that she even cared about clocks. I was surprised by her enthusiasm for the clocks category. Sure enough, the clock selection did not disappoint. She was quite taken with this colorful treasure. 2. The Pinwheel Rug is part of Joy Cho’s new collection. Although there were a number of rugs that caught Lola’s eye, this one was her stand-out favorite. 3. La Pina – This artistic print of a pineapple really struck a chord with my daughter. She likes fruit and she likes art. It’s the best of both worlds! I asked her where we should display it. 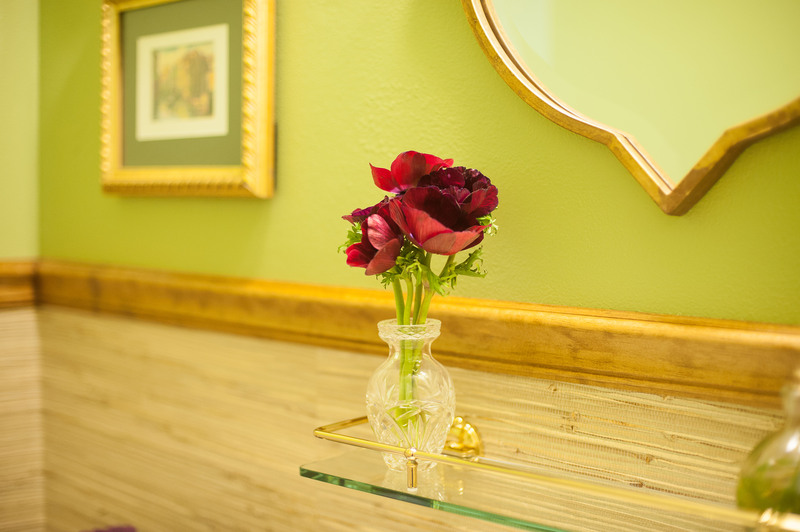 She thoughtfully looked around the family room and found just the right spot on the wall behind our arched floor lamp. Like I said, decorating is in her genes. 4. Oh, the pillows… I could have dedicated an entire post just to Lola’s pillow picks. The Ice Cream Pillow easily took first place, but the adorable Elephants in the Room throw pillow wasn’t far behind. Alphabet pillows are obviously very exciting for a 2 year old, and the Ruched Throw Pillows are just plain pretty. The list could go on, but I won’t subject you to it. 5. Pink Balloon Bedding: they might as well have crawled into her dreams and pulled this image out. She LOVES balloons and she LOVES pink and she absolutely loves this bed. It’s not just about the balloons, though. According to Lola, the blue stripes really complete the look. I think the sheets are actually black, but Lola interpreted them as navy blue, and I have to admit, I like her color scheme better. There you have it. Whether you are almost 3 or in your thirties, The Land of Nod is full of treasures and treats. I hope you enjoyed this virtual tour of one of my favorite online stores.